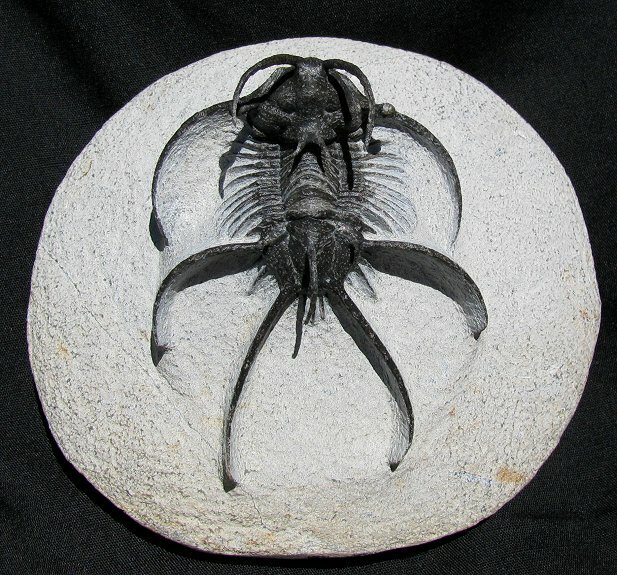 This is a very displayable spiny trilobite from Morocco. It is a large Ceratarges sp. from the Devonian. This 3-dimensionally preserved trilobite has many long, sweeping spines. A pair of long, curving ''horns'' are intact and have been prepared in a free-standing manner on this specimen. In addition to these large spines, each pleuron tip extends into a spine, and there are also many short spines between the larger spines on the pygidium. The eyes are borne on stalks, there are two axial spines, and there is also a long vertical spine on the tail - these have all been prepared totally free of matrix. The bug has thick, dark grey-black exoskeleton that contrasts extremely well with the light-colored matrix. The bug is well showcased on the sculpted block of limestone. This is a very impressive example of a spiny Ceratarges from Morocco.